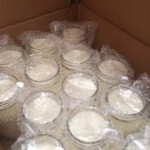 Looking for a large quantity of jar candles? Well you’ve come to the right place to buy candles in bulk. We sell the most sought after jar candle you can find…. a Mason jar candle! Candles comes in many different shapes and sizes. Nowadays, most candles are purchased for the vessel or container that they come in. Repurposing a jar has become mainstream and thats one thing that we strongly support! We believe a good jar should yell “reuse me”. No other jar has stood the test of time like the classic Mason jar. They’re used in literally hundreds of different ways and more creative ways are being found all the time. So if you’re purchasing candles in bulk, the Mason jar candles is the one to go with! Our candles are not only reasonably priced, they are also a great buy because of their long lasting burn time. Each candle last a minimum of 80 hours and when burned in the proper way, can last up to 120 hours long. Thats 7.5 hours of burn time per ounce! Wedding Planners – If you’re a wedding planner that plans weddings frequently. Mason jar candles are a great way for you to bring a great product to your clients at a great price. Wedding couples have been known to put a custom label on the candle lid as a signature and memorabilia keepsake for attendees to take home. Stagers – Whether you’re a real estate agent or a professional stager, you know the importance of staging a home. One way to keep musty smells out while making a home look nice is by decorating it with candles in select rooms. Lit or unlit, our candles give off just a strong enough fragrance to reach throughout the room without overtaking it. Great for bathrooms, master bedrooms and anywhere with vintage furniture. Event Hosts – Anytime you’re getting together with friends and family its a special occasion. It can be nice to have a supply of candles to set out on patio, porch or deck to light up the night. Its a great way to decorate your dinner tables as well. In the summertime they’re great for keeping bugs and mosquitoes away as an added bonus. Interested in larger quantities? Submit your info at the form below and let us know how many you’re interested in and we’ll get back to you within 24 hours. Do I have to purchase all one lid/scent type? No, you may mix and match your choice of lids and fragrances. However, you must purchase in multiples of (6) six, or half case. Do I need to purchase shipping insurance? No. Shipping insurance is included for free and insurance for the full value of the shipment. Am I able to pickup to avoid shipping costs? Yes, pickup is available during our business hours (Monday-Friday). There is no charge to schedule a pickup. Do you accept returns? Yes, we do. If you are unsatisfied with your purchase or they arrived differently than described, you may return them with 15 days of the dates of your purchase for a full product refund. Shipping costs are non-refundable. Can we order candles and have them shipped Internationally? Yes, we are able to ship internationally. Feel free to provide us the address of where you’d like the candles shipped and we can provide an estimate. I own a store and am looking to carry a candle line that can sell for a long time. Would we still purchase via bulk pricing? Actually, No. In addition to our bulk candle pricing, we also wholesale candles through our retailer program, created specifically for retail shops.